How to make your stay as comfortable as possible. 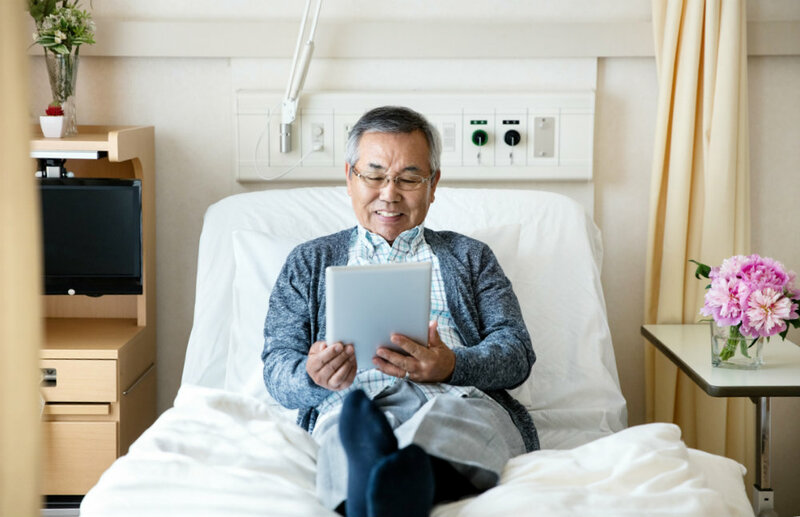 The more relaxed, comfortable and well-rested you are during your hospital stay, the stronger you will be for your recovery. Here are some ways you can make your time in hospital as comfortable and safe as possible. Take books, magazines, music and any other portable entertainment you enjoy that will help keep your mind occupied. Even bringing some small familiar items from home—such as a favourite blanket, photos or children’s drawings can make the hospital environment feel more relaxing. Take deep breaths to de-stress. Deep breathing exercises can help you relax, reduce stress and improve sleep. Just get as comfortable as you can. Take deep breaths, breathing in slowly through your nose. Concentrate on each breath, noticing how your abdomen and chest move as you breathe. Try progressive muscle relaxation. Slowly tense and release each muscle group in your body. You can start with your toes, then your calves, to your thighs, moving up throughout your whole body.Focus on how your muscles feel as they tighten and relax. Don’t suffer in silence. Be sure to let staff know if you’re experiencing pain or discomfort. They may be able to give you pain relievers or help you get more comfortable. This will also help you to relax, reduce stress and may even improve your appetite. All of which will make your hospital stay more bearable and may also improve your recovery. This is the key to getting the best care. The more you can tell your doctor about your medical history, the better care they can provide. Write it down. Write down questions for your doctor ahead of time, so you don’t forget anything. Also, don’t forget to write down your doctor’s answers, or ask him or her to write down key information for you. Be open and thorough about your medical history. Let your doctor know about any symptoms you have and any other medical issues you’ve had. Bring a list of medicines, vitamins or supplements you are taking. Information that seems incidental to you may actually be important. Bring someone with you. It helps to involve a friend or family member in your care. Speak up and be honest about how you’re feeling. Tell your doctor about any concerns you have. Ask about anything you don’t understand or find confusing. Tell the doctor if there is a language barrier or if you have trouble hearing or seeing. Keep everything in one place so nothing gets lost. You want to know where to find information when you need it. A good night’s sleep can help coordination, cognitive performance, mood, metabolism and immune function. Although you can expect noise and interruptions at night, here are some tips for minimising your sleep deprivation in hospital. Bring ear plugs and use an eye mask to block out light. Turn off alarms and switch phones to silent. Aim to relax and calm down for half an hour to an hour before you plan to go to sleep, and don’t use electronic devices just before bed. Don’t drink too much before you go to bed. Take night time medicines in the early evening. Ask to keep the door closed where possible to reduce noise. Anytime you’re admitted to hospital there’s a risk of infection, and this risk becomes higher in people who are older, frail, have chronic health conditions or weakened immune systems. Washing your hands often—and making sure the people around you do too—is one of the most effective ways to prevent infections. You should also ask family and friends to hold off on visiting if they are sick with a cold, flu or other potentially contagious illnesses. Also, tell your nurse if you notice that your dressings are not clean and dry, or if they are starting to come off. Or if the area around your IV drip is dirty, damp or wet or that tubes or catheters feel displaced. You may have little or no appetite while you are in hospital —but it’s really important to keep your strength up, so you need to try to eat as well as you can. Choose foods that you enjoy and think you can tolerate. When you’re feeling better, and your appetite is back you can focus more on changes to your diet that your doctor or dietitian recommends. Tell your doctor or nurse if you are experiencing pain or nausea, as pain relief or nausea medicine may help improve your appetite. And if you have difficulty eating, you may need help from nurses, assistants or relatives—don’t be afraid to ask. It may also help to sit in an upright position when you eat. Also, try to drink small amounts of water regularly, starting when you wake up in the morning. Finally, when it’s time to go home, there are few simple things you and your carer should remember. Medications: Check that you have received a supply of your medication and a copy of the discharge medication list. Help at home: Ensure any services that you need have been organised to start when you arrive home. Equipment: Make sure any equipment that you’ll need at home has been organised before you leave hospital. Discharge summary: Get a copy of your discharge summary (this also gets sent to your GP). Follow-up appointments: Check if you need to make a follow-up appointments with your GP and specialist. If so, hospital staff should let you know how soon you need to see your GP. Make sure you talk to your doctor and nurses about any concerns you have about returning home. Where possible Medibank will ring members to check in and offer support and information before and after their procedure. All Medibank members can also call a nurse with any health question, 24 hours a day, seven days a week. Our nurses can help in the lead up to your hospital stay, as well answer any recovery and rehab queries you have when you get home. To speak to a Medibank Nurse call 1800 644 325.